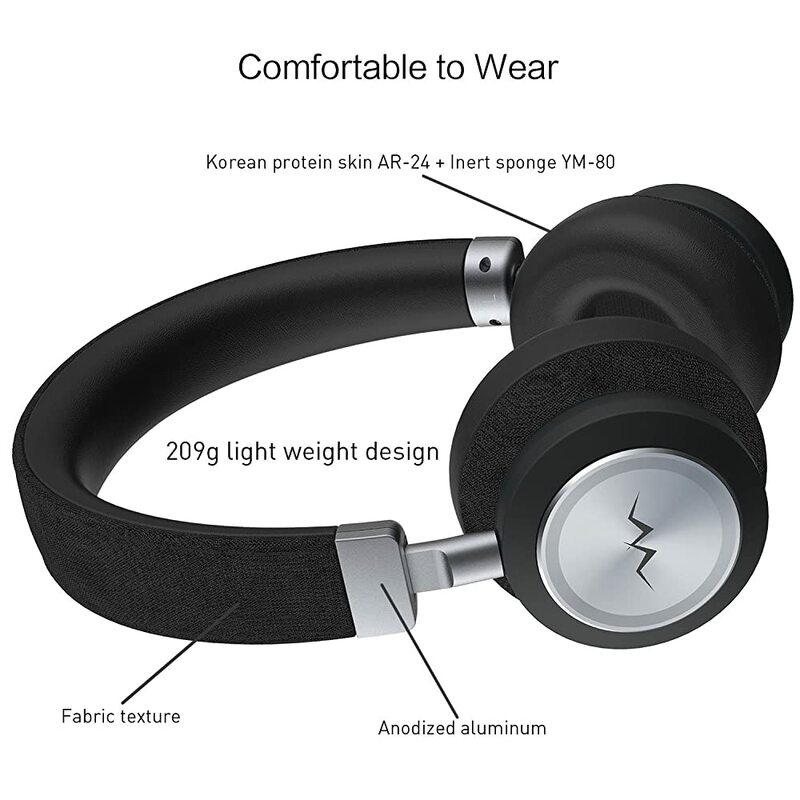 Linner NC80 Active Noise Cancelling On-Ear Bluetooth Headphones is a model with an amazing design. It delivers better than average features at their price tag. This should turn out to be a good win for the Linner’s lineup of products. Now let’s dive into the full Linner NC80 (affiliate link) Review. The headphones are made of plastic, with the back surrounds featuring a rubber treated covering for the grip. The earmuffs have a bit in excess of 90 degrees rotation to them. Taking into consideration the shape of them, they fit well to your head. Obviously, you can slide them in and out to expand these also. The external side of the head back and additionally the back segment of the earmuff pads have a rough fabric like material to them. While the underside of the band and also the pads touching your ears are delicate with an artificial leather material around the foam. They do offer enough flexibility to fit well around the head and maintain a strategic distance from any sort of inconvenience. The features of the headphones justify its price. Phenomenal ANC, great touch features and a fantastic comfort along with other features make these headphones one of the best. So let’s have a closer look at the features of the Linner NC80 Bluetooth On-Ear Headphones following now. Switching between the medium or high ANC will all rely upon how you would like it. ANC will work when using them wired also, as long as the battery still has a charge. At the point when the battery is low or even finished, you can still use the headphones wired. Then the NC80 will function as basic headphones until the point when you get an opportunity to charge them again. The battery itself will last up to 34 hours (up to 19 hours if you are using ANC). 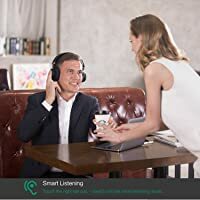 This gives you enough listening time to get you through an entire day. 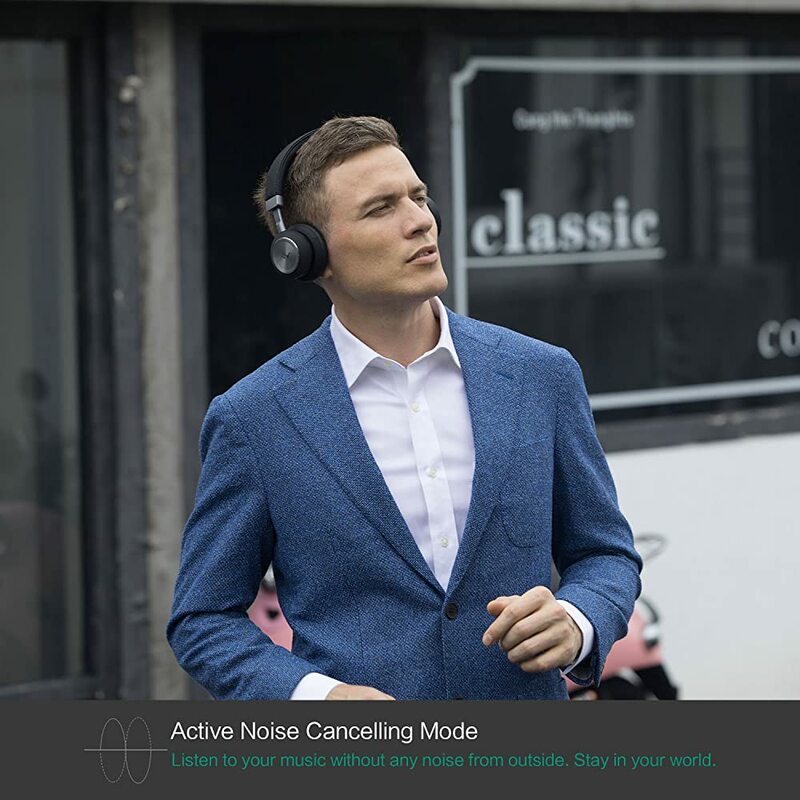 The Active Noise Cancellation is customizable and you can have it on high, medium or off according to the scenario or your needs. Effectively it reduces background ambient noise up to 35dB. This makes the Linner NC80 (affiliate link) headphones appropriate for nearly every situation. For example, the library, gym, office, subway, mobile gaming, and long flights. Linner NC80 Bluetooth headphones have a touch control board on the right side of the ear cup. You are able to choose settings and adjust the volume conveniently. Just tap on the board to play the music or call, and place your hand on it for monitor function activation. Yes, the touch control is intuitive and responsive, you do not have to take your headphones off. Wireless headphones need to have a great Battery life, right? The Linner NC80 fulfills this greatly. After only 2.5 hours of charging the battery is fully loaded and ready for action. You can enjoy listening to your favorite music for an astonishing 34 hours, wireless with the ANC off. Even with Active Noise Cancellation turned on, the battery still lasts 19 hours, giving you plenty of time, great! Its design offers more durability and comfortability with 90° swiveling soundproof skin-accommodating ear cups. The headphones influence you to appreciate fantastic music for quite a while. The unique materials used specifically make the headphones strong and durable. While enjoying comfort to wear, bringing to you a wonderful voyage of music. The incorporated ANC technology has four modes: Noise reduction high, medium, off, and monitor mode. Thus enabling you to adjust noise cancellation levels to your needs. The Linner NC80 Bluetooth headphones (affiliate link) are certified by JAS Hi·Res Audio. The voices are crystal clear and undistorted. The Bluetooth v4.1 standard provides professional sound cavity structure with deep basses and clear mid tones. Through the innovative High-Res Audio, the sound signals get delivered with a dynamic bandwidth and range. It is far more prominent than that of a standard CD. In this manner making it possible to bring you the majority of the excitement and thrill of a live music experience. Linner NC80’s featured Active Noise Cancellation smoothens the noise at a more extensive scope of frequencies. This is achieved by putting an amplifier within and outside of the ear cups. Therefore, the noise gets reduced up to 35db, which is awesome. They’re designed specifically for frequent players, workers, and audiophiles. When the battery is dead or you are interfacing with a non-wireless source, the 3.5mm backup sound link gives you a chance to go wired mode. For instance, when you are on a plane, you can just plug them into the in-flight entertainment system. When you unplug the 3.5mm audio cable, the headphone will be turned off. Linner NC80 wireless on-ear headphone is made with premium materials. It is solid and has a comfortable fit. Weighing only 209g, you can wear these comfortably for quite a long time. Additionally, its beautiful compact design enables you to wear them effectively. Linner NC80 ANC on-ear Bluetooth headphones has a lot of pros. The noise canceling is exceptionally important on these and it does a great job. The sound profile is strong, they are extremely comfortable and the fitting is good. The Touch Controls are solid and work really well. With the great battery life, you can enjoy a really long trip with ease. Packaging is exceptionally decent. The headphones come in a durable box with wired listening cable, charging cable, manual, and good microfiber type pack. Nothing is perfect, thus the Linner NC80 also has some negatives. The Touch Control lags are a bit of irritating. It would be decent to have a lesser degree of a lag between enlisting the information and doing the activity. When you put on, take off, or adjust the headphones, it sometimes happens that you accidentally change the levels of the Active Noise Cancelling. Another point is, that you cannot fold the headphones, which makes it not very feasible for travel. The Linner NC80 headphones (affiliate link) deliver good performance at a reasonable price. They have all the features expected from good headphones. Their ANC performance is their greatest winning worth. The touch control on right muff is a pleasant touch (a play on words) too. By delivering a performance close to something from famous companies, their ANC truly fulfills the requirement of a good headphone. Regarding comfort, they do feel great on the head. Therefore, you can go quite a while with these before they cause an unpleasant feeling. They come with a delicate drawstring bag to store them in. Additionally, you get a 3.5mm aux link (no 1/4-inch connector), a micro USB to USB cable and a lot of documentation to walk you through everything in a couple of different languages. Overall the Linner NC80 is a good choice if you are looking for on-ear headphones with ANC and Bluetooth feature. Next articleWhat is a headphone amp, and why would you need one? again for these exceptional thoughts you have provided in this case. look over your blog post. that were not helpful, I believed my entire life was gone. might have negatively affected my career if I had not discovered your blog post. I had not come upon such a solution like this. site to any individual who will need counselling about this topic. you for all of the great techniques you are sharing on this website. to share with my best friends. I would tell you that many of us visitors are rather blessed to live in a fabulous community with many brilliant individuals with great methods. have regularly enabled most people just like me to realize their ambitions. I’m also writing to let you understand what a wonderful experience my cousin’s princess enjoyed going through the blog. of selected very confusing things. You truly did more than her desires. cool tips on your topic to Gloria. I precisely desired to appreciate you all over again. teaching other individuals all through your web page. I know that you’ve never come across any of us. to just be giving out instructions which often people today might have been selling. And now we take into account we now have you to give thanks to for this. matter is interesting, which is unbelievably indispensable. take interest in making time for investigation and it’s obvious why. rest of the year. Your conducting a very good job. your heart. “We are near waking when we dream we are dreaming.” by Friedrich von Hardenberg Novalis. hello!,I love your writing very a lot! proportion we communicate more approximately your post on AOL? the tabs as well as related info ended up being truly simple to do to access. You, my pal, ROCK! I found simply the info I already searched everywhere and simply could not come across. Merely wanna remark that you have a very decent site, I the design and style it really stands out. am pleased to find this website through google. “Wisdom doesn’t necessarily come with age. Sometimes age just shows up by itself.” by Woodrow Wilson. Some genuinely nice and useful information on this site, besides I think the design and style contains wonderful features. excellent posts. “Beware lest in your anxiety to avoid war you obtain a master.” by Demosthenes. Dead indited subject material, regards for information. “He who establishes his argument by noise and command shows that his reason is weak.” by Michel de Montaigne. btw great design. “Treat the other man’s faith gently it is all he has to believe with.” by Athenus. I conceive this web site has got some real great information for everyone :D.
Some really fantastic articles on this website, thanks for contribution. ps decent website . “Justice is the truth in action.” by Jeseph Joubert. conceive this web site is very informative ! Retain posting . Rattling superb info can be found on blog . “An executive is a person who always decides sometimes he decides correctly, but he always decides.” by John H.
to read and obtain info . “Practice, the master of all things.” by Augustus Octavius. “What is harder than rock, or softer than water Yet soft water hollows out hard rock. Persevere.” by Ovid. let me rephrase that: Thanks for lunch! “We have two ears and only one tongue in order that we may hear more and speak less.” by Laertius Diogenes. conceive that your website is very interesting and has got circles of wonderful information. “With silence favor me.” by Horace. They’re really convincing and will definitely work. Still, the posts are very brief for starters. believe. At all times go after your heart. “A simple fact that is hard to learn is that the time to save money is when you have some.” by Joe Moore. I will right away take hold of your rss feed as I can not find your e-mail subscription hyperlink or newsletter service. Great website. A lot of helpful info here. I’m sending it to a few friends ans also sharing in delicious. hello!,I really like your writing so so much! share we communicate extra approximately your post on AOL? I just couldn’t go away your site before suggesting that I really enjoyed the standard information a person supply for your guests? What i don’t realize is in truth how you are now not really much more well-appreciated than you may be now. vital infos. I’d like to peer extra posts like this. this website holds some rattling superb info for everyone. “Anger makes dull men witty, but it keeps them poor.” by Francis Bacon. I was examining some of your blog posts on this internet site and I think this site is real instructive! thank you for your honest response to my review of the Linner NC80. I appreciate that you have highlighted the overuse of “amazing”. I wasn’t aware of that when I wrote it. So now I’ve replaced these with some matching synonyms.